The gift will establish endowed scholarship for out-of-state students wishing to attend New College. New College of Florida has received a $1.2 million bequest from the estate of Howard and Betty Isermann, a large portion of which will be used to establish an endowed scholarship fund to benefit out-of-state students who wish to attend New College. Howard Isermann passed away in August 2017, and his wife Betty died in June 2018. “This incredibly generous bequest will enable us to realize the dreams the Isermanns had for New College, for now and for the future,” says Felice Schulaner, chair of the New College Board of Trustees. During their lifetimes, the Isermanns gave much of their time and money promoting education, medical research and the arts. 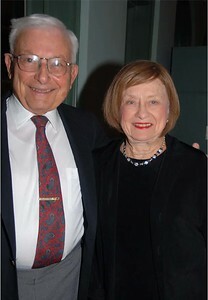 The couple’s tie to New College dates back to the 1990s; their generous endowment gifts have funded various academic initiatives and scholarships, the construction of the Keating Center and the dedication of the Betty Isermann Fine Arts Building, a teaching facility and gallery that opened in 1998. An accomplished artist working in watercolors and acrylics, Betty Isermann studied with renowned watercolorists Nicholas Reale, Ed Whitney, and Charles Reid. Entering juried shows in New York and New Jersey, she won several prizes and participated in numerous group exhibits at major corporate headquarters. Her artwork hangs in various locations on the New College campus and in the local community. Peter and Katie Hayes and their family recently dedicated the new garden outside of the New College Foundation’s Keating Center. The New College Foundation has received a $1.2 million bequest from the estate of Howard and Betty Isermann.